Even though we have only lived in our townhouse for four years this month, we have already updated/upgraded our landscaping in the courtyard. The courtyard was originally designed and planted by nationally known landscaper Jon Carloftis (also here, here, and here.) However, there was a period of five years when no one lived here, and that lack of attention was hard on the plants. 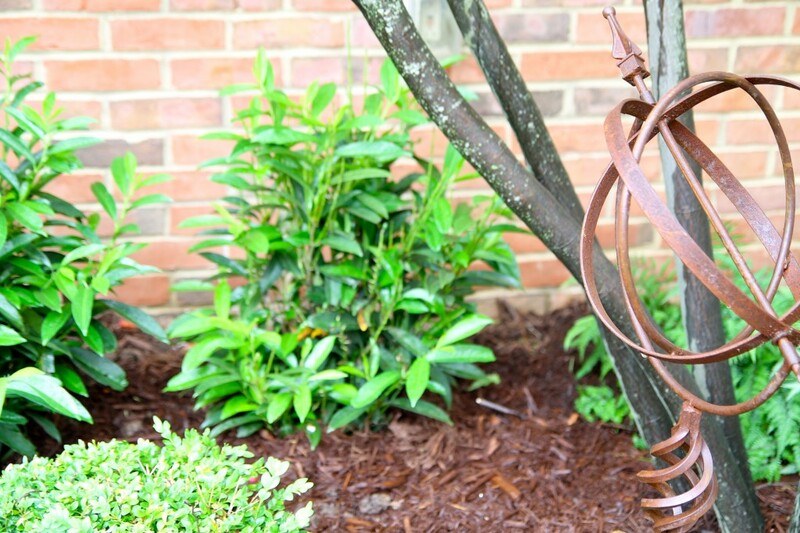 When we moved in, we had to remove all of the shrubs because they were in such bad condition and kept just the service berry trees, a sweet magnolia tree, and an espaliered apple tree. 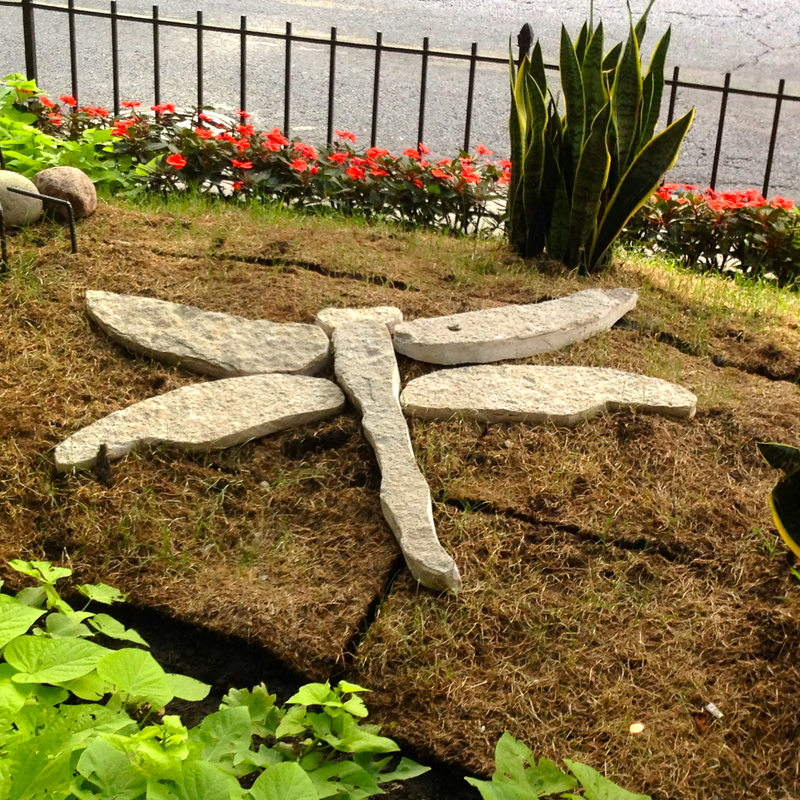 This is what our courtyard looks like now. To get to this point we removed the sweet magnolia because it had overgrown its space, and just this spring we chopped down the apple tree. It was plagued with a fungus and also had outgrown its little patch of dirt. We also removed the knockout roses that we planted when we moved in because they just weren’t doing well. 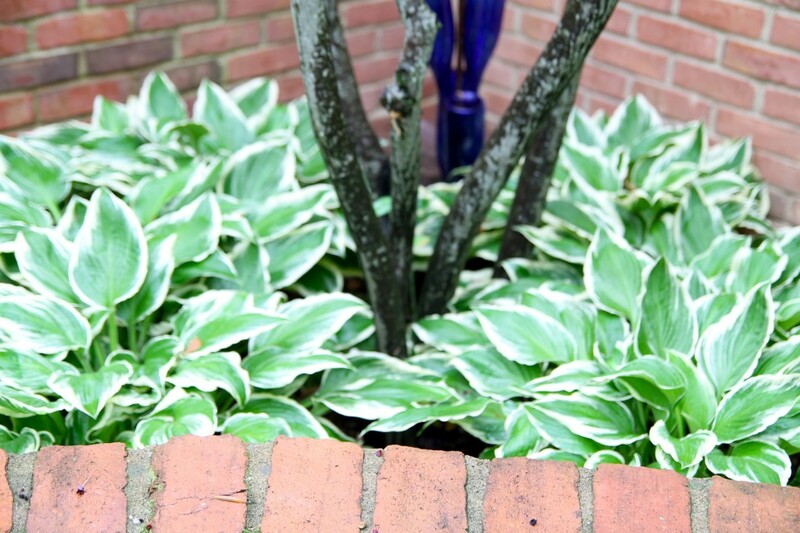 Other than the original service berry trees, the only remaining plants were boxwoods, hostas, and a clematis. We put in all of those plants our first summer here, and they are all doing very well. 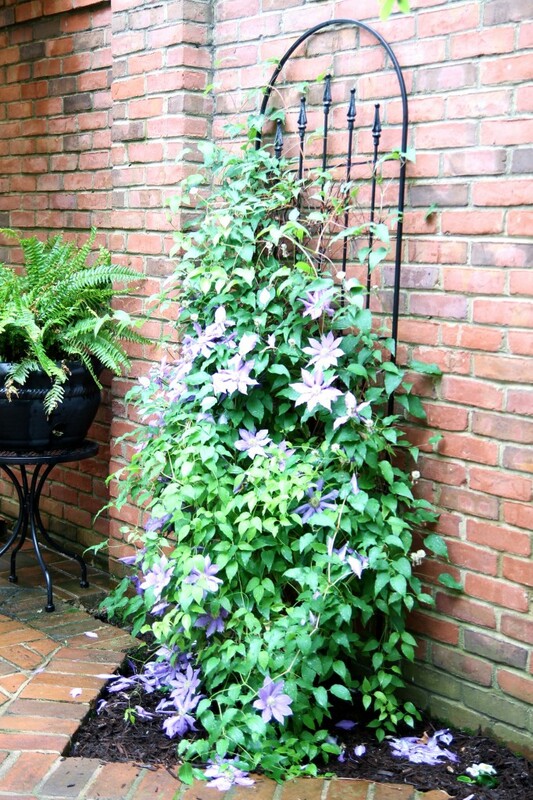 This spring when we had a break from all of the rain, we added two espaliered pyracanthas and…..
…..an additional clematis to partner with this gorgeous one. Their job is to soften the brick, and they do it nicely. 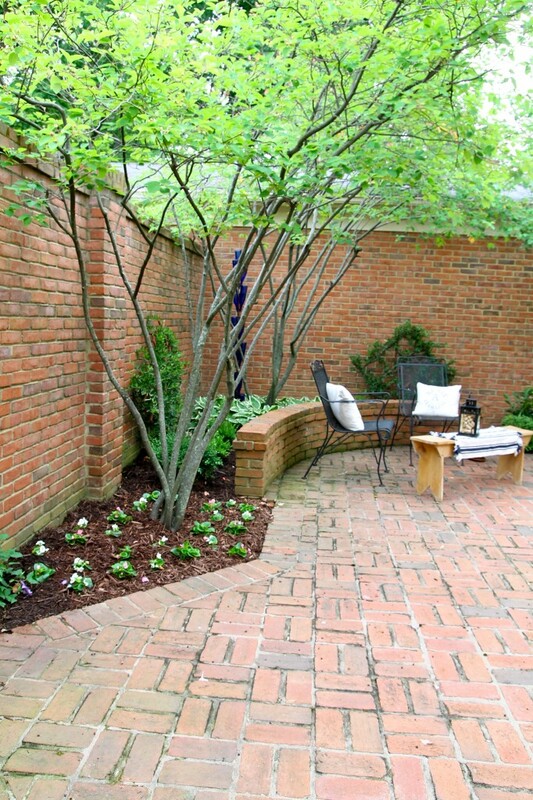 To fill in behind the boxwoods, we planted laurels, and more boxwoods went in the area behind the little brick wall. 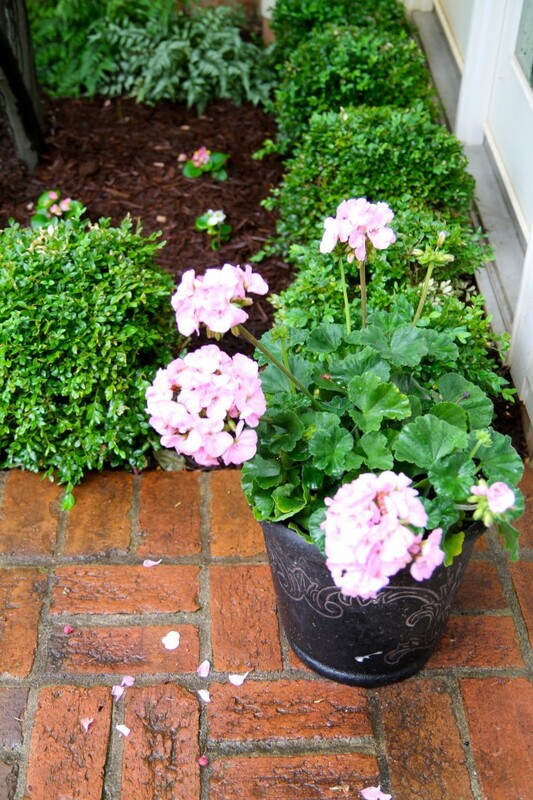 I planted pink and white begonias for our summer color. They are tiny now but will fill in nicely and be a burst of color by mid-June. Of course, I also have my treasured herb garden. We will plant an espaliered crab apple tree on this brick wall next spring. It’s all about softening the brick. 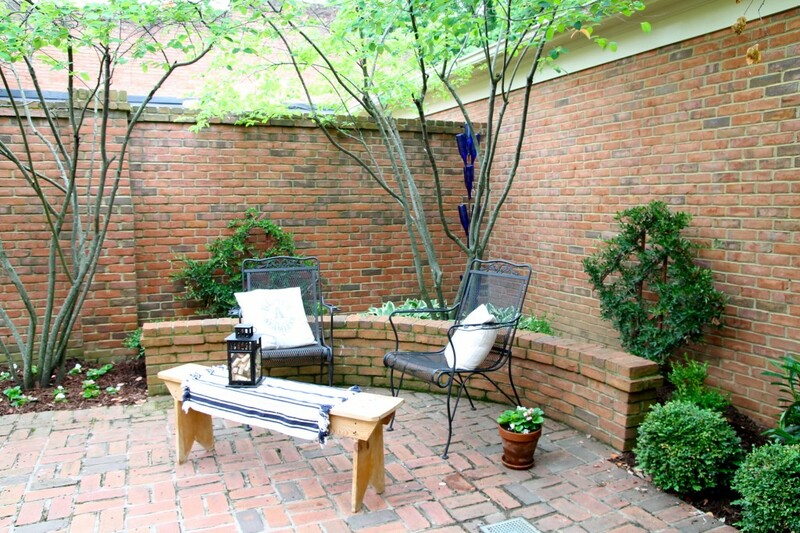 One of the many things I love about our courtyard is that even though it is small, it still has distinct areas like an eating area, a sitting area, and a gardening area. I was so impressed by the courtyard at Ralph Lauren’s restaurant in Paris and am working toward achieving that look. Oh, we can’t forget the all important bar area. I replaced the wooden top with a slab of black granite and will show that to you soon. The wood just wasn’t holding up in the weather. I took these photos at two different times between rain storms. 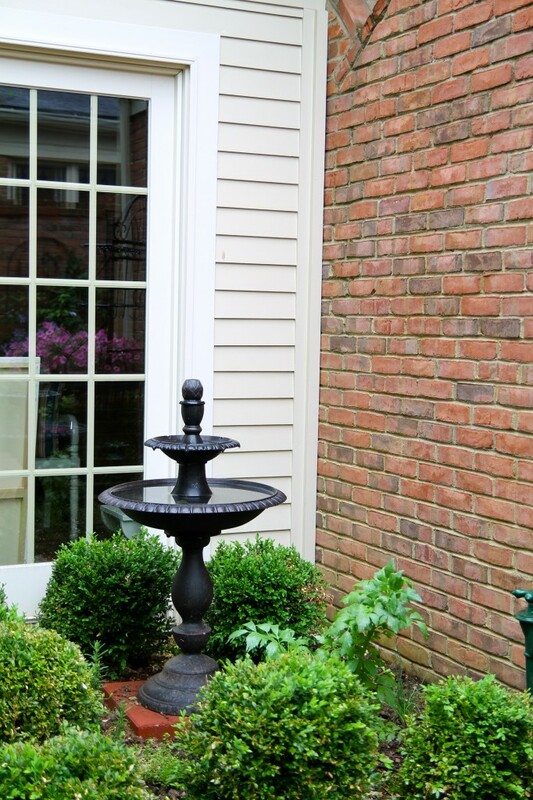 You have probably noticed that the bricks are wet in some of the shots and dry in others. It isn’t staged the way I would like it to be. When we first decided to downsize to a townhouse, one of my requests was that I had to have some dirt to play in. I didn’t want to have just a balcony in a condo. I had to have dirt. 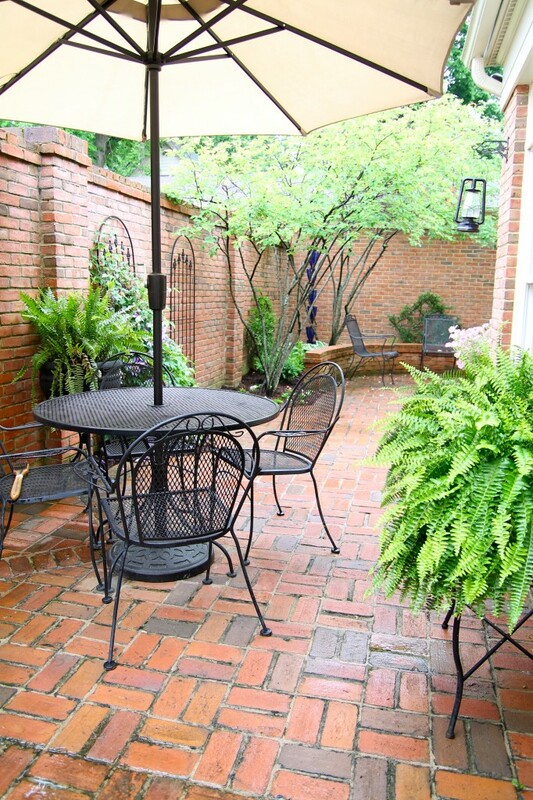 When we found this place with its charming and private courtyard, we both just knew it was the one. 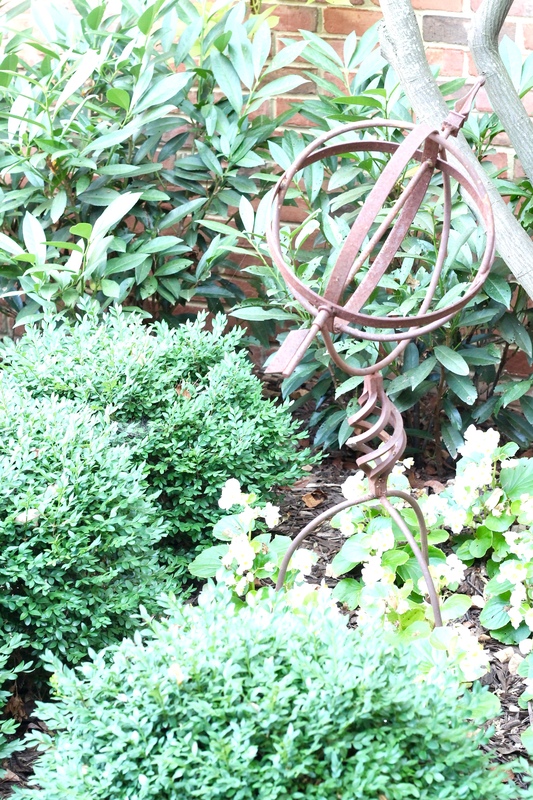 I can spend hours out in the courtyard reading, eating, pulling weeds, trimming, and all around enjoying life. It has become a very special place. Thanks so much for stopping in. I hope you enjoyed the courtyard tour. 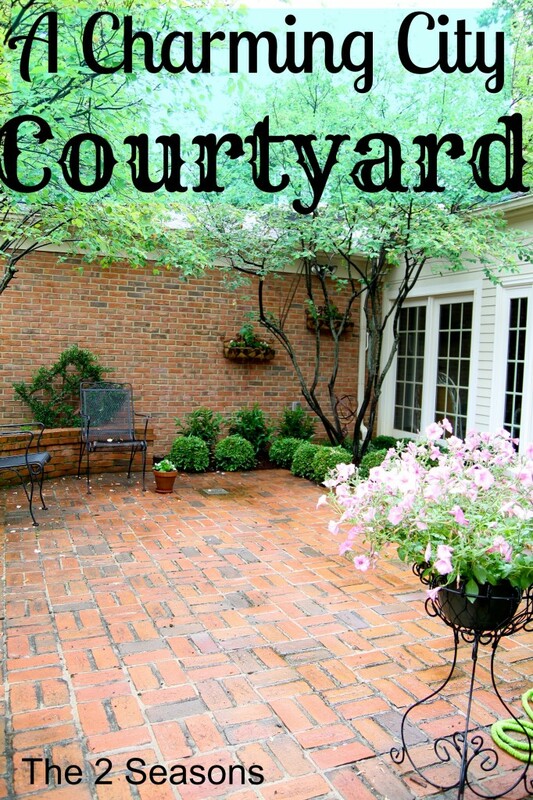 Your courtyard is lovely. I have never had luck with clematis. Do you have any tips? I live in Ashland. Enjoy your blog. Marian, I’m told a clematis likes feet in the shade and a head in the sun. Apparently, I have a good area for them. The service berries are slow growers, which we need. They have blooms and then berries, which the birds love. Those pyracantha are going to be a bear to prune with the thorns. You’ll need long heavy gloves. Beautiful! Makes me want a townhome! 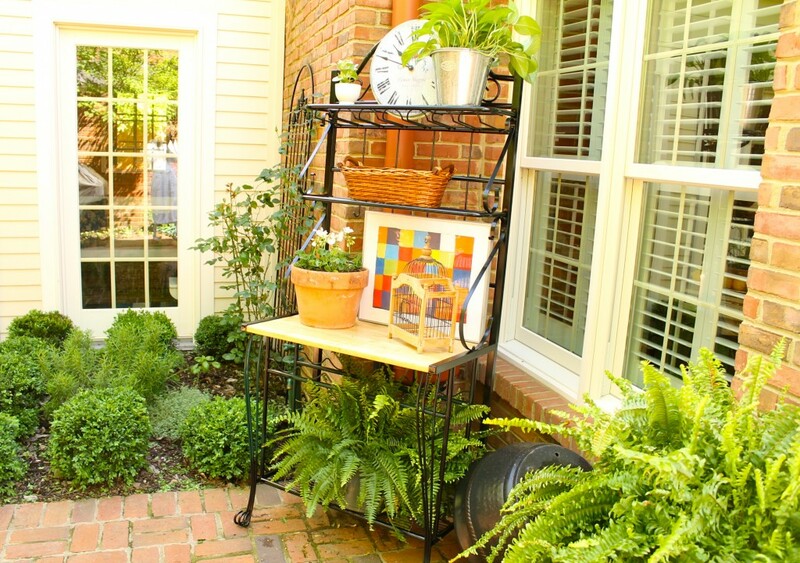 So very, very beautiful Janette…I am looking forward to my downsized home someday with a fabulous courtyard such as yours….I so love all of your espaliered trees and shrubs…..such gorgeous area to spend time in…..